Is the pickup in growth for real this time? For years the pattern has been the same. At the beginning of the year forecasters acknowledged that growth has been weak but envisage a pickup later in the year. As the year wears on, however, the monthly numbers disappoint or come in mixed and forecasts are marked down. This year, severe winter weather led to a sharp turndown in economic activity in the United States in the first quarter, followed by a bounce-back in 2Q. The consensus among economists has been that real GDP growth will settle in to a trend-like 3% rate in the second half and into 2015. Economists are also forecasting an upturn in growth in Europe and Japan as extraordinary monetary stimulus shakes economies in those regions out of the doldrums. Paradoxically, meanwhile, equity markets have risen worldwide as corporations have found ways to raise earnings despite the uneven and generally sluggish growth in their economies. Is this pattern coming to an end, or can we look forward to a repeat of the now familiar pattern? In the United States, the case for stronger growth appears to be on fairly solid ground. No single sector is booming, but most are showing signs of sustainable expansion. Equipment spending by corporations, which has fallen short of levels typical in past economic expansions, is this year rising at a 6.6% rate — up from 4.6% last year. Housing construction came virtually to a halt this winter in the northern states, but is on track to rise at a double-digit pace in the second half of this year. With belt-tightening largely over in state and local governments, government spending, which has declined for four years in a row, will no longer be a drag on growth. Consumer spending is rising at a 2.3% pace, which is not fast enough to provide much of a boost to the rest of the economy, but sales in some areas, such as motor vehicles, are strong. Exports, meanwhile, continue to expand at a modest pace despite slow growth abroad and a higher dollar. More than a few observers expected the massive provision of liquidity by the Fed through its quantitative easing (QE) programs since 2008 to have resulted by now in a rise in inflation. (In quantitative easing the central bank buys bonds and pays for them by crediting banks' reserve accounts — in effect by printing high powered money.) So far that has not happened. The Fed's preferred measure of inflation, the Personal Consumption Expenditure ex Food and Energy price index, has failed to rise above the Fed's target of 2% in the past four years, and rose at only a 1.5% annual rate in July. Moreover, the bond market expects inflation to remain under control. The long-term expected inflation rate implied by the difference in yields on nominal 10-year Treasury bonds and 10-year TIPS is currently just 2.02% (as of September 18, 2014). 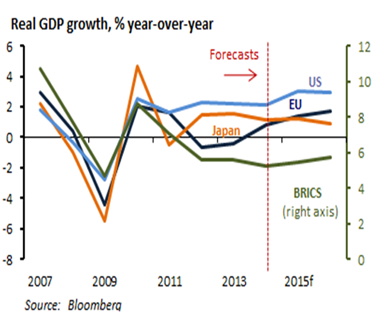 The picture abroad is not as rosy, but there are reasons to expect an improvement in coming quarters. The euro area is out of its post-crisis recession, though it barely grew at all in the first half of the year and is still skirting with price deflation. The European Central Bank (ECB) has initiated a number of measures to stimulate the economy, including cutting short-term interest rates to nearly zero, charging more for banks to park their money at the Bank, and promising to engage in large-scale bond buying in a milder version of the quantitative easing (QE) engaged in by the Fed. Bond yields have dropped throughout the eurozone, in part reflecting weak credit demands but also the prospects of ECB stimulus. Amazingly, yields on 10-year government bonds in Ireland and Spain are now trading below those on 10-year U.S Treasuries. 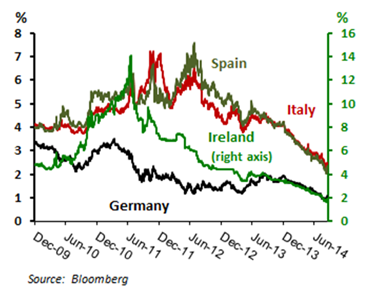 The market, at least temporarily, appears to be charging either a small premium or no premium at all for credit risk despite the region's recent history of bailouts and a default by one member state (Greece). Japan's economy, meanwhile, shrank 7.1% in 2Q following a hike in the country's consumption tax to 10%. Policymakers deemed the tax hike necessary to curb growth in Japan's public debt-to-GDP ratio, which at over 200% is one of the highest in the world. The tax hike, however, now appears to be a replay of the widely criticized decision in 1997 to hike Japan's consumption tax in the face of a weak economy; the tax hike effectively ended an incipient expansion. Plans for a further tax hike, however, have been put on hold. Japan's government, meanwhile, insists it is pushing forward with further QE-type monetary stimulus measures to stimulate the economy, and to follow through on promises of fundamental reforms in the regulatory hamstrung Japanese economy. In both the euro area and Japan, one of the main results of the extraordinary monetary easing underway has been decline in their currencies. 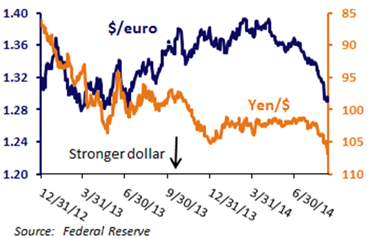 Further declines in the euro and the yen relative to other currencies, including the dollar, are likely, in our view. The weaker currencies will eventually make exporters in the eurozone and Japan more competitive, which will boost growth in the rest of their economies. The short-run effects, however, will include a decline in the value of euro- and yen-denominated stock and bonds for dollar-based investors. The rise in the dollar may also hurt the sectors of the U.S. economy that obtain a large portion of their revenues from overseas sales, such as energy, materials, technology, and — to a lesser extent — industrials. Some caution is in order before concluding that these sectors will underperform, however, because they are among the sectors most likely to benefit from a pickup in growth in the United States and abroad. In the years before the 2008-09 recession the more globalized U.S. sectors outperformed because they benefitted from both a falling dollar and strong growth; those two factors are now working to counteract one another. In sum, our base case scenario for the outlook is one that allows for cautious optimism. The U.S. economy seems to be getting onto a path of modest, noninflationary growth. Economic performance in Europe and Japan has disappointed, but massive monetary stimulus and weakening currencies point to a pickup in activity within a few quarters. 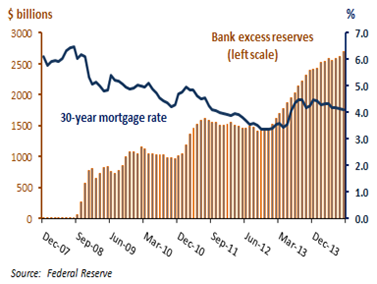 Interest rates appear to be poised to rise gradually in the United States, but not abroad. Stock markets around the world have managed to do well in worse circumstances than these over the past few years, and there might seem no reason to expect otherwise in the near future. While the outlook for the global economy is generally favorable, it would be foolhardy not to acknowledge the existence of downside risks. In our view the main risks are a pop in inflation, stagnant growth, and a collapse in China's economy. Let's take a look at each in turn. An upside inflation surprise? Since the Fed began its QE programs in 2008 it has added over $2.2 trillion in Treasury and mortgage-backed securities to its balance sheets. Central banks in the United Kingdom, the euro zone, and Japan have also engaged in substantial monetary easing. Critics have long warned that the extraordinary monetary easing would result in inflation, but inflation has remained low and sometimes slipped into deflation in the world's major economies in recent years. The main reason inflation has not increased is that an enormous amount of slack has existed in the global economy. Even in the fastest growing economy in the developed world, the United States, the pace of the recovery has lagged past recoveries. But the unemployment rate, which was rising when the Fed began its first QE program and eventually reached 10%, has since fallen to 6.1%. In other words, the slack in labor markets is now smaller, suggesting that the likelihood of a pickup in inflation has risen, and is arguably the greatest since the end of the recession in August 2009. 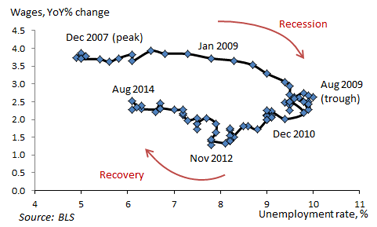 1 See Michael Feroli, "Pent-up wage deflation: lessons from the Great Depression," JP Morgan Global Data Watch, September 12, 2014. The Congressional Budget Office estimates that the U.S. economy is currently operating at about 4% below its full-employment potential. This is below the 7.2% potential GDP gap reached in 3Q 2009, but still large enough to make the development of a wage-price spiral appear to be many quarters away. Success in avoiding inflation, however, ultimately rests with the Federal Reserve. 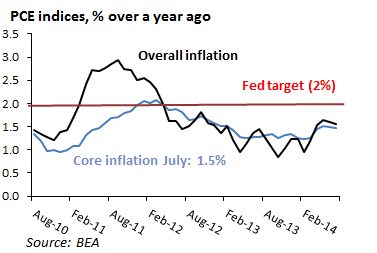 Fed officials are confident that they have the tools to nip any unwelcome rise in inflation in the bud. Skeptics are not sure that the enormous amount of liquidity added to the financial system since 2008 can be removed easily or quickly. Stagnant growth? Although the U.S. economy is in its strongest position since the recession began in late 2007, it has managed to eke out an average growth rate of only 2.1% in the five years since the end of that recession. And despite that growth, the economy is still one of surplus labor and surplus capital: Unemployment, while falling, is still above full-employment levels and long-term interest rates are still some of the lowest in decades. Business investment is picking up, but corporations are still sitting on hundreds of billions in idle cash. Loan volumes are also picking up, but most of the trillions in reserves provided to the financial system still reside in banks' excess reserves. The concern is that the economy may lapse back into a slow growth mode, and that the tepid growth could last for years to come. Explanations for the slow growth of the past five years abound, including political uncertainty that has made firms reluctant to invest, inadequate aggregate demand, a rapidly aging population, infrastructure bottlenecks, and the exhaustion of productivity gains from a more educated population. Analysts will be trying to sort out the influence of these factors on growth for years to come. Our view is that the slow growth is a largely predictable as fallout of the unusually severe 2008-09 financial crisis and recession. As Carmen Reinhart and Kenneth Rogoff noted in their 2009 book This Time is Different (published at the beginning of the current run of slow growth), it is not unusual for economies to take many years to recover from the collapse of a real estate or other bubbles. It takes time for balance sheets to be repaired, net worth to be restored to comfortable levels, and resources to be redeployed to more productive uses. The most likely scenario, in our view, is that for the United States, this adjustment process is mostly over — but a longer period of slow growth must be acknowledged as a possibility. A collapse in China? It is hard to envisage China's policymakers as walking a tightrope, but that is what they are doing in trying to achieve balanced growth. They are trying to contain an overheated real estate market, keep a lid on inflation, maintain a competitive currency, and reform bank lending practices — all without curtailing growth. Real GDP growth in China, which averaged 9.7% per year in 2002-10, has since slowed to a 7.3% pace, and some economists believe there is considerable risk that it may fall below that pace. A deceleration to 7.3% GDP growth can be attributed mostly to the slowdown in growth in China's major export markets. The slow-growing European Union, for example, is normally the destination for about 19% of China's exports. Some of the slowdown can also be attributed to the maturation of the Chinese economy, and the beginning of a shift from export-led growth to growth intended for the domestic market. Growth in developing countries often slows once the big gains from transfer of rural workers to production in urban centers are over. Any decline in China's growth below 7%, however, would be worrisome and have global implications. It was China's extraordinary growth in the past decade that was one of the main drivers of commodity prices and of growth in emerging economies that supplied China with raw materials. 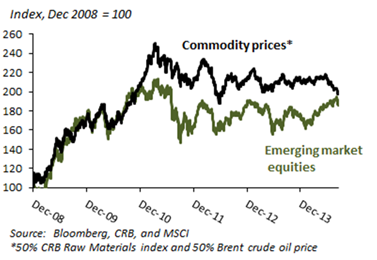 It is no surprise, then, that emerging market equity prices and commodity prices tend to track one another closely (Exhibit 7). It is also no surprise that growth has slowed in several Latin American economies such as Argentina, Brazil, and Chile that have been among the largest suppliers of the commodities that fueled China's growth. But a slowdown in China and other emerging markets affects the developed markets, too. According to IMF research, a one percentage point slowdown in growth in the emerging economies lowers growth in the developed economies by a quarter of a percentage point because of reduced trade. This suggests that trade is a two-way street: While a slowdown in growth in the developed world reduces the demand for exports from the emerging economies, slow growth in the developing world can subtract from growth in the advanced economies, too. The challenge for investors this year has been to try to determine whether weak patches in the United States, Europe, and Japan are transitory or symptomatic of a longer stretch of stagnation to come. In all three regions the outlook now appears a bit brighter. Fed tapering is coming to a close, and the markets expect a gradual tightening of short-term rates to begin next year. This outlook does not, in our view, imply that large shifts in our investment recommendations are warranted. The main elements of our investment strategy have been to maintain a substantial allocation to equities, to avoid long duration in fixed income and favor bonds that provide a spread over U.S. Treasuries, and to stay diversified using alternatives. Within equities we continue to tilt our allocation toward international markets, especially in the developed world, but have a tactical underweighted position in place in the emerging markets. We will be watching closely as economic developments unfold, with an eye on whether the Fed will be forced by growth and inflation surprises into a more rapid tightening than the markets envisage, or, conversely, growth disappoints once again and inflation remains subdued. Through those firms, Cetera Financial Group offers the stability of a large and well-capitalized broker-dealer and registered investment adviser, while serving independent and institutions-based financial advisors in a way that is customized to their individual needs. Cetera Financial Group is committed to helping advisors grow their businesses and strengthen their relationships with their investor clients. All of Cetera Financial Group's broker-dealer firms are members of FINRA/SIPC. For more information, visit ceterafinancialgroup.com.